2. Make sure the staff person did the work. This is an important one. “Thanks for working with Dr. Symonds office to set up a referral program. We are starting to get patients referred and your good work in contacting the office has been recognized.” But what if it was ANOTHER employee who actually did the work in contacting Dr. Symonds’ office staff? Make sure you have the correct information on who did the work and who is due the accolades. 3. Don’t pile on a few compliments all at once. You want to make the compliment stand out as a memorable event. Dealing with each accomplishment individually is the strategy to use. Too many comments strung together lessen the impact and the compliment gets diluted. Ditto the same for negative criticism. 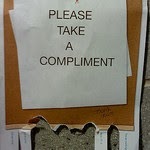 Give every compliment or criticism its own time and place. 4. Give the compliment, ask a question, and then listen. 5. Make sure the good performance is also shared up the chain of command.